The price for a gallon of unleaded gas fell by about 15 cents in March, ending the month at a national average of $3.636, according to AAA. 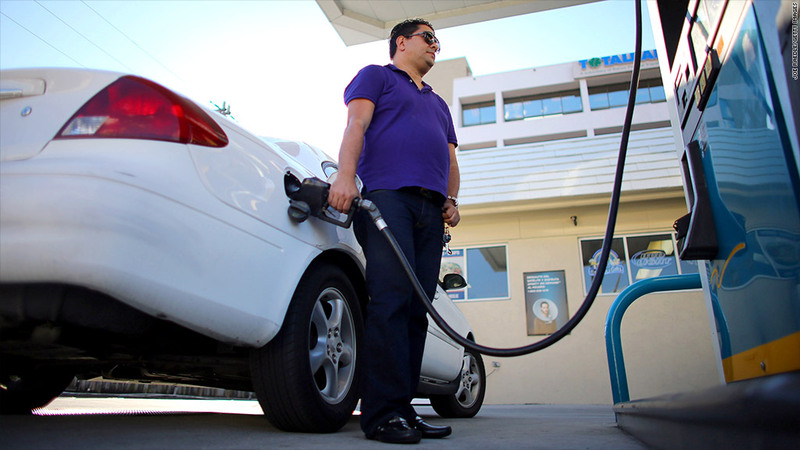 You paid less for gas, groceries and clothing in March. The price for a broad basket of consumer goods fell 0.2% in March, according to the Labor Department's Consumer Price Index. Compared to a year earlier, prices are up only 1.5%, a level of inflation that's considered benign. For consumers, cheaper goods and services could be a boon at a time when unemployment remains high and take-home pay has declined, thanks to the expiration of the payroll tax cut at the beginning of the year. That said, lower prices could also reflect weaker economic growth. Other reports show hiring slowed, retail sales declined and consumer confidence waned in March. Either way, many economists expect to see more price declines ahead. The key lies in cheaper gasoline. "Anyone who has filled their car with gasoline knows that energy prices have fallen over the last month, which was the single largest factor in keeping price increases contained," said Steve Cunningham, director of education and research at the American Institute for Economic Research. After spiking in February, the price for a gallon of unleaded gas fell by about 15 cents in March, ending the month at a national average of $3.636, according to AAA. Gasoline prices have continued to decline since March and are expected to fall further over the next few months. Weak global demand, more fuel efficient cars and increased North American oil production have all contributed to the lower prices. Meanwhile, the CPI report also showed food prices at the grocery store fell 0.1% in March. Prices on whole milk, potatoes, lettuce and pork chops all declined during the month. But food prices at restaurants and cafeterias rose slightly. Stripping out energy and food shows prices on most other goods and services rose a bit during the month. Airline fares increased 0.6%, hospital services increased 0.4% and used car prices rose 1.2%. Clothing prices were an exception, falling 1%. From the Federal Reserve's point of view, low inflation gives the central bank more leeway to continue its stimulative policies, including the bond-buying program known as quantitative easing. The Fed's goal is to maintain inflation around 2% a year over the long-term. Recently, though, it has made clear that it would be willing to tolerate inflation of up to 2.5% a year to focus instead on bringing the unemployment rate down. "Coupled with the largely disappointing jobs report for March, the Fed is well-positioned to continue to pour gasoline on the fire," said Jim Baird, partner and chief investment officer for Plante Moran Financial Advisors. The Federal Reserve monitors several inflation measures, the most prominent of which comes from the Commerce Department. That measure, which strips out energy and food, shows consumer prices were up 1.3% year-over-year in February, well below the Fed's 2.5% threshold.